We added feta to the burgers themselves for a nice twist on the standard turkey burger, and we used a chopped salad as a sort of chunky salsa for the burger. It was pretty good, but not amazing. Mix all ingredients thoroughly with your hands. Form into 4 patties. Pan fry the patties on the stove (or BBQ, if you have one handy). This takes about 5-8 minutes on each side for the meat to be fully cooked, which you want when you are cooking poultry. Whisk the vinegar, olive oil and mustard to make a vinegarette. Mix the rest of the ingredients in a bowl, the pour the vinegarette over the veggies and stir to combine. 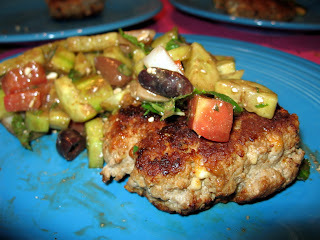 Eat on its own as a side salad, or serve over the top of the feta burgers, as we did. On the weekend we have a little more time to put together a breakfast with a few more ingredients. 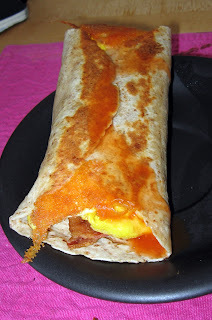 For this one we sauteed diced chili pepper, onions and brocolli until all were tender, then scrambled with some eggs and rolled it all up with bacon in a low carb tortilla, then sealed it up with cheese in a frying pan. 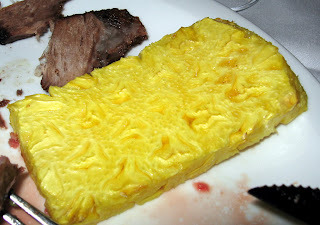 A friend of ours had a hankering for some meat, so we figured there couldn't be a better place than Brazilian BBQ. Well, it all started well and good, and it ended that way too, it was just the interim that was a bit iffy. So, we called at 8pm and got a reservation for 9:30. We thought, fine, ok, we'll play cards or something at the office until then. Mind you, we were told we had a reservation, not, an "if you come we might be able to seat you". In any case, we arrive at 9:25 and are told it will be a few minutes, which is fine, since we did get there a few minutes early. 20 minutes later we are getting hungry, and our table is nowhere in sight. We were keeping our cool however, until 10pm rolls around and a group of 10 strolls in and gets immediately seated before us. Then things got ugly. Let's just say that neither we, nor the staff of Espetus, were on our best behavior at this point in time. The result, however, was that we were finally seated at 10:15, a full 45 minutes after our reservation. We just kept thinking about that Seinfeld episode: "you know how to take the reservation, you just don't know how to keep the reservation". In any case, despite this rather terrible experience, we'll probably go back, but certainly not on the weekend. I mean, it IS all you can eat meat. Mundane detail: the all-you-can-eat meat and salad bar is $40 per person. Ok. Would have been better without the rice. A bit dry, but maybe that's because we got the edge. They always try to fill you up on the salad bar at thee types of places. We try not to eat too much from the salad bar so that we can get our money's worth with the meat. But these were nice condiments for the meat. Surprisingly good. Tasted like, um, chicken, seriously. 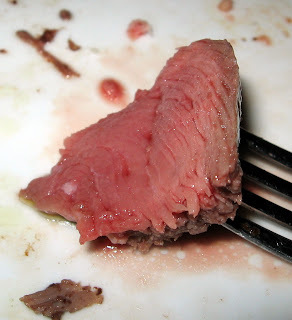 Super tender and juicy. 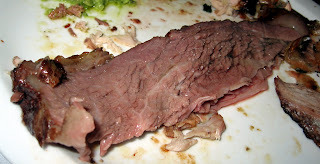 Probably the best meat we had all night. Very, very good. Sweet, tart, warm, carmelized. Yum. Flavorful, if a tad overcooked. The shells were rather hard to peel for some reason. Yum. 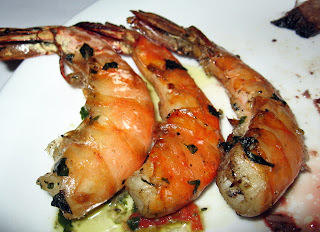 This was tender, juicy, fatty and fall-apart tender. 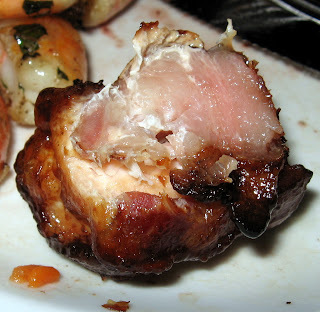 You'd think that everything wrapped in bacon would be great, but this chicken was just too dry. We haven't eaten here in over a month, but then we ate here 3 times in a week. I guess it goes in waves. This time it was catered in at Alexis' work, and delicious yet again. Alexis had had a migraine all day and was not quite up to cooking, so we picked up some Indian food at our favorite Indian take-out place on the way home from work. 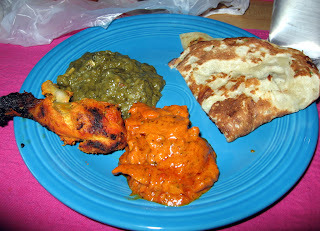 The tandoori was a bit dry, but had a great spice mixture on it. 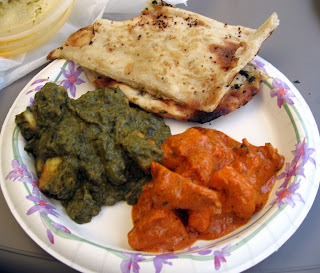 The mahkni and the saag were delicious, as always. And Mehfil has the best naan we've ever had. This soup held up better than expected after a few days. Tasty and healthy. A very simply, sort of retro lunch. 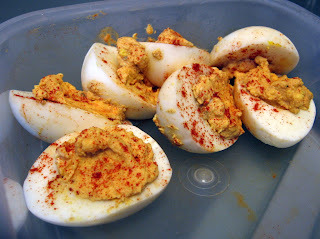 This version is kicked up with a healthy dose of dijon mustard. Halve the eggs and pop out the yolks. 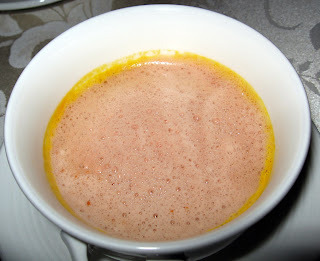 Mix the yolks with the rest of the ingredients until smooth. Spoon the yolk mixture back into the concave of the eggwhites. Sprinkle with paprika. This was just awful. It had no redeeming qualities. It even looks sad. 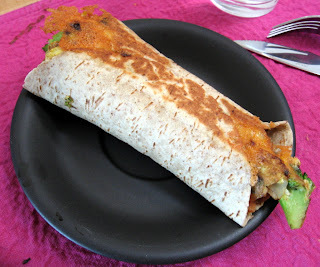 This burrito is packed with protein and fiber and is a great way to start the day. 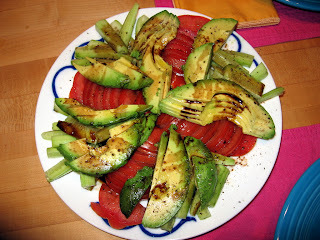 This is a (sort of) composed salad dressed very simply with balsamic vinegar, sea salt and pepper. Arrange the sliced veggies on a plate, then season with the vinegar, salt and pepper. Super-quick for a perfect weeknight meal. Sautee garlic in a bit of olive oil. When just beginning to brown, add in the shrimp and season with salt and pepper. Cook for a couple of minutes, stirring frequently. 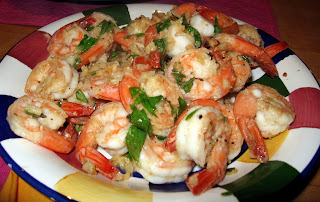 When shrimp are pink, add the lemon juice and the basil, stir and serve. Still tasty, a few meals later. Giao has now referred to this soup as "the best" even though it was a few days old. 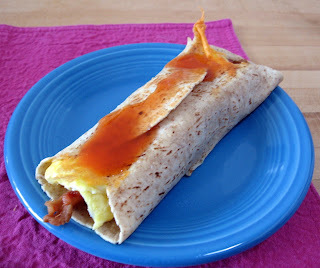 Slathered in hot sauce for a nice kick in the morning. So, we went to the StarChefs Rising Stars Revue tonight and had a fabulous time. The food was plentiful and the drinks free-flowing. We got to try over a dozen dishes, some from chefs whose food we'd never eaten. 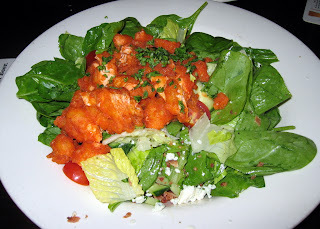 We were impressed by some and underwhelmed by others, but overall, the food was of very high caliber. The standouts of the night for us were James Syhabout and Mark Dommel on the savory side, and Nicole Krasinski on the sweet side. 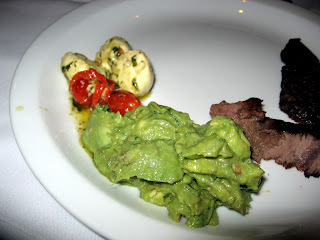 Oddly enough, when it came time to vote for the favorite dishes of the night, our top few weren't even in the running. There were 3 dishes that were tied, when the tie was broken by a final vote. In the end the top 3 were Chef Lahlou's Cous Cous, Pastry Chef Leong's Pineapple and Blueberry Upsidedown Cake and Chef Dommen's Lightly Smoked Trout, with Dommen's Trout winning in the end. Our favorite dishes were Dommen's Stinging Nettle Ravioli and both of Syhabout's dishes, the Foie Gras and the Chicken Confit. On another note, Jonah Oakden of Blue Plate, the only chef/restaurant we had not previously heard of was not in attendance because he was getting married. That's a good enough reason for us, and now we have a good reason to go try out Blue Plate. Following is the rundown on everything we tasted. 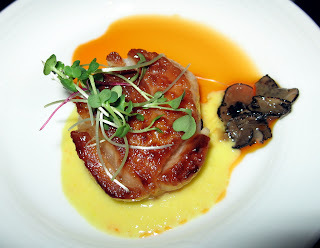 The chili oil was nice, but there wasn't a lot going on here, and the scallop was a little too lukewarm for our taste. 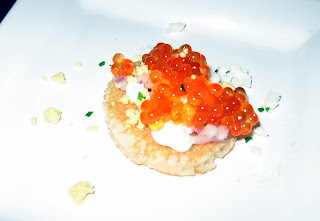 How can you go wrong with fresh caviar. 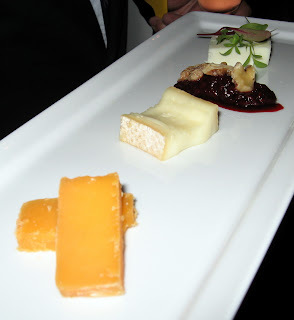 Standard cheeses, but the fresh blackberry (we think) compote was very nice, and refreshing. We'd eaten at One Market a few times before and were decidedly not impressed, however, I think we're gonna have to give them another shot. Mark Dommen totally blew us away with his Stinging Nettle Ravioli. Alexis' favorite dish of the night. The pasta was light and delicate, and the flavors were earthy an briny and totally delicious. Lightly Smoked Sea Trout "Mi Cuit"
Also very good, and the audience winner of the night, this dish was beautifully plated, topped with a nice sunny-side up quail egg. We love chef Syhabout and his food and today was no exception. Velvety, rich and delicious. 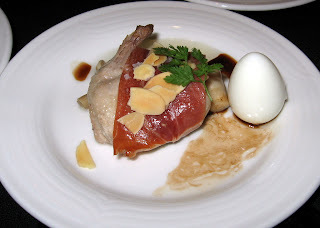 Giao loves foie gras; we'd had Syhabout's sous-vide foie before and were happy to have it again. However, after 3 dishes, it was even a bit rich for Giao. Everyone does duck confit, so chicken confit was a refreshing take on this preparation. 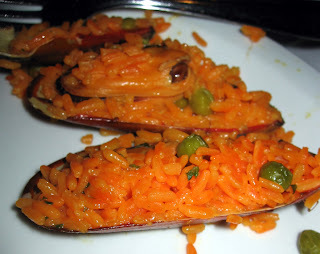 This dish was pertectly tender and slipped right off the tiny bone. And the miniscule flower blossoms were a beautiful addition to the plate. 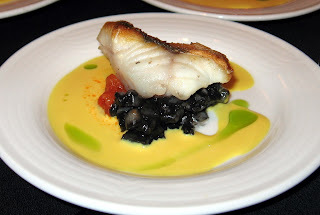 We haven't eaten at Campton Place yet, but these were solid dishes and we'll probably give it a try in the future. This would have been very good, except that the interior was raw and we had no knife. It was very hard to eat this piece of fish without a cutting apparatus. But when we got it in our mouths, it was good. 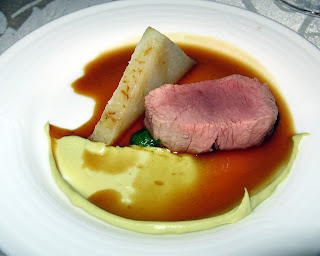 The lamb was juicy, tender and flavorful and the pistachio puree was utterly smooth and added a sweet nuttiness that went very well with the lamb. Having only recently eaten at A16 and having been blown away by his food, we thought his offering today was solid, but not his best. If we were him we would have served the tripe and the mozzerella. This was a tasty, solid dish, but it was not particularly inventive. 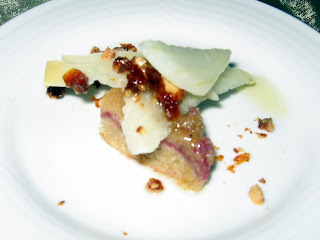 We had the ciccioli when we ate at A16, but without the radishes. The radishes and salsa verde were a nice touch and cut through the fattiness of this house-cured salumi quite nicely. We'd eaten at COCO500 once before, and we were not impressed the first time. However, we will be going back to give it another try, as these little bites were quite tasty. 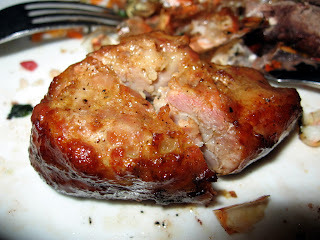 The flavors melded well in this bite-size morsel. Bacon Wrapped Monkfish with Zesty Tomato Sauce and Brocolli Rabe. Everything is better wrapped in bacon. And this was no different. It was a bit hard to eat with that little wooden stick. Very tasty. Giao isn't the biggest fan of Moroccan food, but Alexis ate at a Moroccan place every year on her birthday when she was growing up and considers herself a bit of a connossieur. 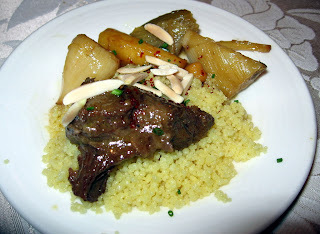 Chef Lahlou's food was traditional and yet innovative and sophisticated. 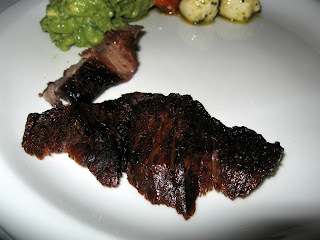 The beef cheeks were so tender we could eat them with a spoon and the firm roasted veggies imparted great flavor. 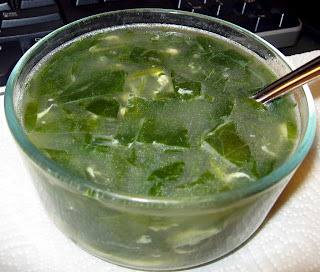 At first we were not that impressed with this soup, but as the flavors melded in our mouths, this interesting soup made our mouths happy. We had eaten once at Bushi-Tei before, and found the food good, if expensive. Tonight, however, we thought Chef Wakabayashi missed the mark. The ideas were good, but the execution failed. This was all a bit bland for what should have been a great combo. Also, it was a bit cold by the time we got it. This was a great concept, but poor execution. The confit had an almost mealy texture that was very off-putting, and the hard-boiled egg was just sitting there and we weren't sure how to eat it all together. 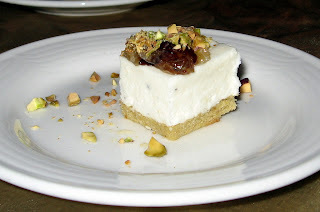 When we ate at Rubicon, we opted for the cheese plate rather than a sweet ending to our meal. Next time, we'll order dessert. The cheese added a savory flavor profile that made the other flavors pop. This was Alexis' favorite of all of the desserts on offer tonight. The flavors of the rose petal and the pistachio were matched by a light lemon cream. The texture was half way between a fresh marshmallow and a cream. This this was ethereal. We'd eaten dessert at Gary Dank before and found the desserts to be huge in portion. I think we were able to enjoy them more this time, in smaller quantities. This was our least favorite dessert because it was just too sweet. But it was the crowd favorite, so maybe it's just that our palette's can't handle the sweet as much as other people's. Yum. Firm, ultra-silky chocolate cream topped with little crumbles of coffee flavored crunch. The ice cream added a nice flavor/temperature contrast. Full Disclosure: StarChefs was kind enough to give us press passes to this event. UPDATE: Click here for the coverage of the event itself. We haven't been here yet, but we've been wanting to for a while and we are going this Friday. UPDATE: We went to A16 Friday and it was awesome. We are so excited to eat his food again soon. Click here for our previous review. We haven't been here yet, either, but we have been meaning to get around to it and are pretty excited to try his food. Haven't been here and in fact, we haven't even heard of it so we can thank StarChefs for bringing this place to our attention. We LOVE this place. Great food. Very innovative and delicious. 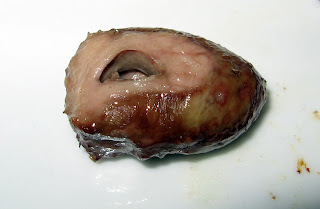 We've had the sous-vide foie and are excited to eat it again. Click here for our reviews. We ate here a month or so ago during the film festival, as it's very close to the Kabuki. We felt it was good, but very expensive. The foie gras with pumpkin custard was delicious. Click here for our review. We're eager to give NOPA another shot as the first time was a bit spotty. 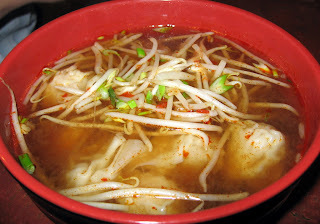 Although, they did win an honorable mention for our best soup of 2006 award. Click here for our review. Haven't been here for no good reason at all. So, we're excited to give it a shot. We went to Rubicon a few weeks ago for the first time and thought it was amazing. We didn't order a dessert, but the petit fours were pretty great. Click here for our review. The desserts we had at Gary Danko go down in our personal history as the biggest portions ever. Click here for our review. We've eaten at Michael Mina in the Westin St. Francis, but not just the Westin St. Francis itself. In any case, this event looks like it will be loads of fun--there are also wine pairings. If you are in SF next Tuesday, you might want to check it out. After discovering that leftovers we had previously frozen were a bit past their prime, we headed off to Good Earth, for some good wontons. The wontons are full of shrimp without too much filler. 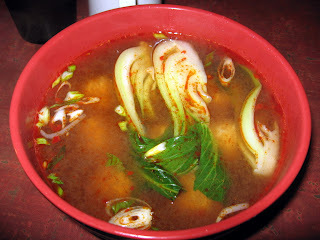 And the broth, while a bit sweet, if packed full of flavor. Double the wontons for less than double the price. Yum. 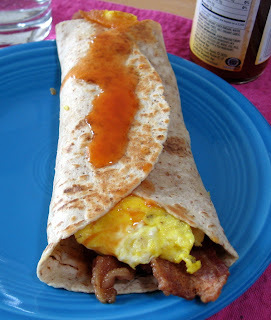 Topped off with hot sauce, this is a hearty, hand-held breakfast. 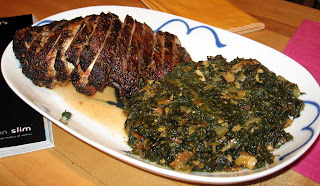 Pork loin is cheap and very easy to cook and creamed spinach, while a bit labor intensive, if worth all the work. Pre-heat the oven to 375. 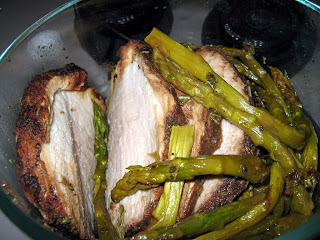 Mix all ingredients except the pork loin into a marinade. 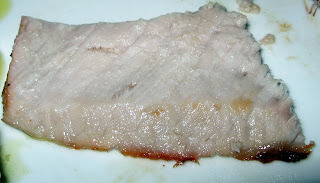 Then coat the pork loin and let it marinate for at least 1/2 and hour. Then roast until the internal temperature reads 135. Remove from the oven and let sit for 20 minutes. In addition to increasing in temperature by another 15 to 20 degrees, bringing the pork to a perfect temperature, this time allows the juices to redistribute within the meat. Then clice and serve. 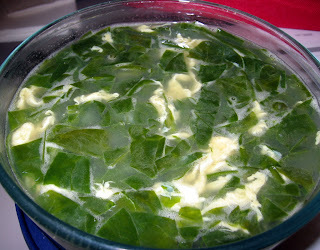 Click here for the recipe for this delicious creamed spinach, chock full of bacon.